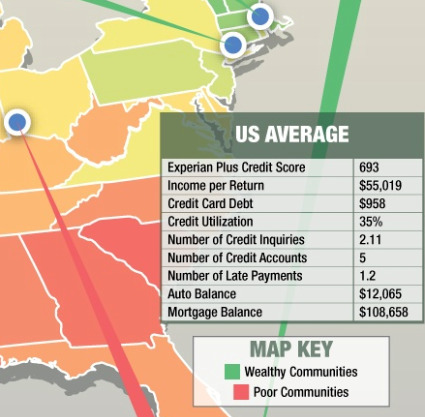 The credit score and credit report blog SpendOnLife.com took an in-depth look at the credit scores of the five richest and five poorest neighborhoods by income to find out what separates the swank from the slum. In the same feature it also ranked each state by average credit score, so you can see how you stack up to your neighbors. One of the first things you'll notice about the richest and poorest neighborhoods is that you have to actually look at the data twice to see where the differences are. While the number of credit accounts and mortgage balances vary greatly, the values of other items such as credit utilization all hover pretty closely at the national average. The five Richest Neighborhoods in the U.S. The 5 Poorest Neighborhoods in the U.S. Among the most interesting facts found while compiling this survey, according to SpendOnLife? The much-coveted 800 credit score was nowhere to be found. While you'd expect a bigger difference in credit scores between the richest and the poorest, and possibly even an 800 in the richest neighborhood, according to the Wall Street Journal, once you hit the mid 700's, the benefits gained from raising your credit score are "meaningless." It's easy to see how you stack up against the U.S. average, which is always a welcome pat on the back (or a much-needed kick in the pants) to start getting your act together.How does your 'hood score? If this is your kick in the pants, sign up for a budgeting program like Quicken Online or Yodlee and read through our Credit section, which will help you understand how credit scores are calculated and whether or not canceling that card will hurt your credit score.